Rinse slab of pork belly under cold, running water, then pat dry with paper towel. Slice into 1½ inch cubes. 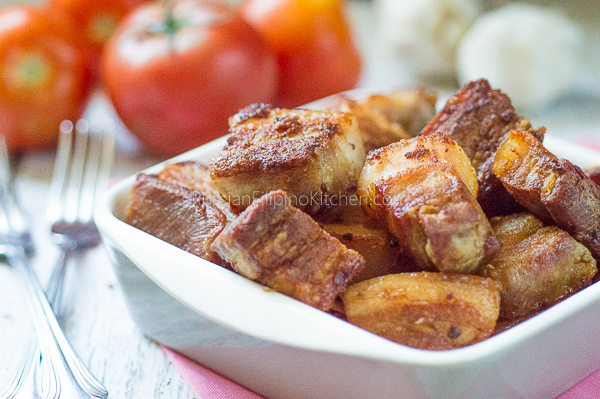 Arrange pork slices side down on a wide skillet and sprinkle with ¼ teaspoon salt. Turn stove on high and cover. As soon as the meat starts to sizzle and the fat starts to come out, turn down heat to low, and put the cover back on. Covering the pan is optional, but I personally do it to brown the meat faster as the heat is trapped when you put the lid on. It's also great for avoiding oil splatter. If you don't wish to cover the pan, use a splatter guard or wear protective clothing and be extra careful when you're close to the stove. In my experience, cooking on low heat significantly reduces oil splattering. Another tip is to keep pouring the melted fat into a heat-resistant container so if the meat pops while frying, there is less oil to splatter. As soon as the meat is browned on one side (about 20 minutes), use a kitchen tong or spatula to flip the slices. Sprinkle with the remaining ¼ teaspoon salt. Cover and continue cooking. Scoop the oil from the pan and transfer to a heat-proof container such as a Pyrex cup. Continue rendering the fat until the meat has shrunk further and has browned on all sides. Remove from heat and drain pork slices on paper towels. Pour the rest of the oil into the container and allow to cool. Strain and place in a glass jar with a tight lid and store in the fridge for later use. Serve the "pinakupsan" chicharon-style with dipping sauce or store in a zip top bag or sealed container for use in cooking later on.